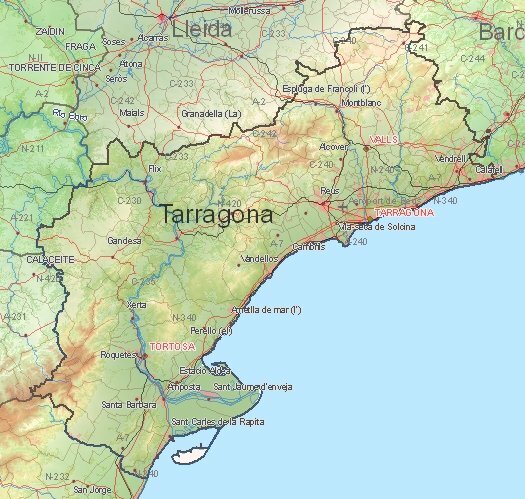 Beach holiday on the Costa de Tarragona? : from the 1st century after Christ immediately behind the coast-line (Costa Dorada). Other Roman remains are visible in the national archaeological museum. Further travel-tips for this city are the Roman aqueduct just outside the city next to the highway A7 and the remains of a Roman circus. : Largest wetland in the western Mediterranean sea-area with over 300 bird species. In Llacuna de la Tancada you are able to see flamingos. : limestone massif with great fauna west of Tortosa. : theme park in Salou with the themes: the wild West, China, Mexico, Polynesia and the Mediterranean. : Cistercian monastery from the year 1151, located in a valley about 10 kilometers from Montblanc in the inland of Tarragona. Soon Tarragona webcam, blogs, travelreports, spanish recipes and movie locations. 1) Current weather in Tortosa (temperature, precipitation).